How Well Do VMVPDs Meet Viewer Priorities? These services haven't matched pay TV's trump cards. Virtual MVPDs (including the just-launched Hulu Live TV service) were developed as a less-expensive alternative to traditional MVPD subscriptions. But over the time these services have been available, there’s been no appreciable drop in the number of viewers who subscribe to pay TV. 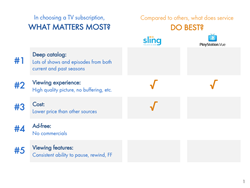 Why haven’t Virtual MVPDs made more of a dent in pay TV subscription? According to Hub’s annual “What’s TV Worth” study, 88% of viewers with broadband have a pay TV subscription—statistically unchanged from 90% in 2014. The two virtual MVPDs that have been around the longest—Sling TV and PlayStation Vue—each have penetration levels of only 6%. 2. Viewing experience: Picture quality, lack of buffering, etc. Then viewers were asked to rate the strengths of the Virtual MVPDs they use, on the same list of attributes. Few of the top viewer needs were also seen as strengths of, for example, Sling TV or PlayStation Vue. Watching live falls low on the list of consumer needs: The ability to watch shows at the same time they air ranks 10th on the earlier list of attributes consumers consider when choosing a TV service. The amount of TV viewed live has been dropping steadily: Consumers estimate that only 35% of their total TV viewing time goes to live TV. That’s down 13 points from 48% in 2014. Especially among key targets for Virtual MVPDs: Among Millennials, only 27% of all TV viewing is live. “Part of the big appeal of platforms like Netflix is that they are the ‘anti-TV’. Virtual MVPDs are different from pay TV, but in a more incremental way: they’re still bundles of networks. And their gaps in content or features are enough to keep many consumers from switching from pay TV, even though the price is lower,” said Jon Giegengack, co-author at Hub. “What’s TV Worth” was conducted among 2,026 US consumers with broadband and who watch at least 5 hours of TV per week. The data was collected in April 2017. An infographic and excerpt of the report are available as a free download from Hub Entertainment Research.